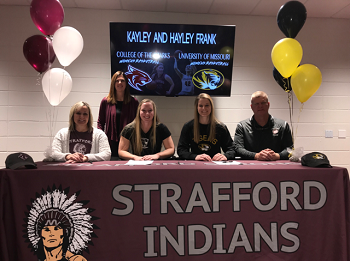 College of the Ozarks Lady Bobcats’ Head Coach Becky Mullis is pleased to announce the recent signing of Kayley Frank to the 2019-2020 recruiting class. Frank is a 5’9 forward from Strafford High School, who averaged 14.6 points and 8 rebounds per game during her junior season. To open the 2018-19 season, Kayley is just six points away from hitting her 1,000th career point. A three-time All-Conference and All-District performer, Kayley also achieved an All-State selection her junior season. Kayley brings with her a record of 99-3 thus far in her career, as well as three state championships. Her team finished the 2018 season with a national ranking of 20th overall and 5th in the nation of public schools. Kayley is a three-sport athlete, also competing in golf and softball. She qualified for the state golf tournament, and her softball team has won two state championships.